London: Published on 5 September, the Times Higher Education World University Rankings 2017-2018 place Newcastle University 175th in the world, up from its position of 190th in 2016. The University scored particularly highly in the research and international outlook components of the survey, ranked in the top 100 for its proportion of international staff. Professor Chris Day, Vice-Chancellor and President, Newcastle University, UK, said: “Our improving position in the latest Times Higher Education World University Rankings – our highest in five years – highlights the quality and global impact of our research in areas as diverse as health, culture, technology and the environment. The £500m portfolio of projects includes a £30m investment in new sports facilities and a £34m Learning and Teaching Centre with state-of-the-art learning facilities for up to 2,200 students across three floors and a 750 seat auditorium. This summer the University opened the £58m Urban Sciences building – the new home for the School of Computing Science and its 1,395 staff and students. Next year will see the completion of the £75.5m Park View Student Village which replaces the former Richardson Road accommodation block to become home to 1,300 future students. 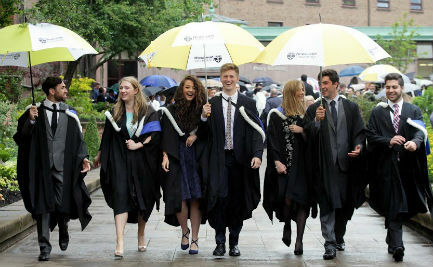 The latest rankings data sits alongside the University’s strong performance in other international league tables, including the QS World University Rankings, which saw Newcastle move up to 161st in the world, and the 2017 Leiden Ranking where the University moved up 9 places to 105th globally. Times Higher Education World University Rankings evaluate universities across all of their core missions: teaching, research, knowledge transfer and international outlook. The rankings guide encompasses 1,102 top universities in the world, making it one of the biggest and most influential international league table. The rankings draw on 195 separate data points, as well as 250,000 items of reputation data and bibliometric data from Elsevier, based on almost 62 million citations to 12.4 million research publications over five years.